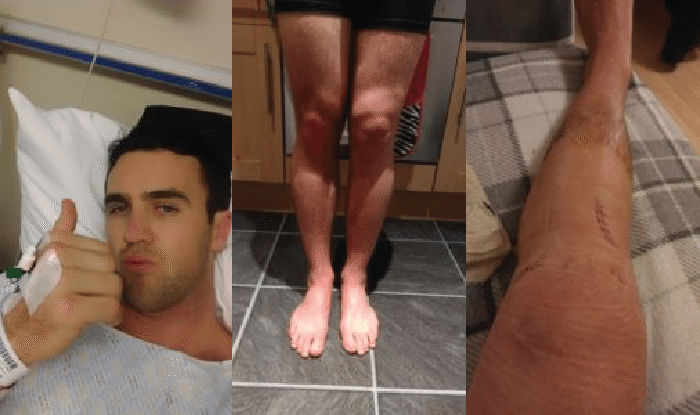 Today is the first in a series covering what it’s like to return to rugby from a major injury. It was motivated by our friend Clarke Cayton’s two-part series on returning to rugby from a broken leg. If you’ve returned to rugby from a major injury and would like to be paid to share your story, we’d love to hear from you! Please email get@ruckscience.com. There is no one to blame for my ACL injury but myself. People tell me it was bad luck or bad timing or both. The truth is that it was my fault and I could have avoided the injury or at least I could have minimized the risk of it happening to me. I know I had let my prehab and rehab exercises slip. I got a little bit busier with work and a little bit less concerned with the important little things I had learned as a professional player. 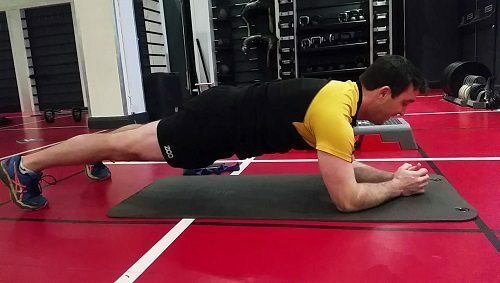 The years of work on a Rugby fit body and injury free seasons were slipping every day as I lost my focus on preventative training. Now? I’m another in the long list of rugby players who have torn their ACL. What is an ACL tear in the knee? ACL injury. The anterior cruciate ligament (ACL) is one of the key ligaments that help stabilize your knee joint. The ACL connects your thighbone (femur) to your shinbone (tibia). It’s most commonly torn during sports that involve (1) impact to the knee, sudden stops and changes in direction. Resting when I needed to rest. Battling my own mind and being impatient. Learning to walk properly by using the crutches to assist in a full range of motion of the knee. Pushing past a little pain for full leg extension and flexion. Correcting imbalances in the body. Keeping up cardiovascular fitness when you are unable to run. Getting back to full fitness for sport. Being weeks away from playing again and then suffering another injury in the same knee. Being confident to play at the same level. Evaluating retirement and watching my team get beaten without me. There are many reasons why we tear or rupture our ACL. Approximately 75% of ruptures are sustained with minimal or no contact at the time of injury. Sidestepping is the typical mechanism that causes the ACL to tear, that being a sudden change in direction or speed with the foot firmly planted. A direct blow to the side of the knee, hyperextension of the knee or quickly changing direction, landing from a jump or turning. Chances are you know someone who has done it. I was playing club rugby and made a break on the short side. One big step off the left foot to accelerate, possibly uneven ground, muscle fatigue or instability in the knee and… POP! Caught in the open field by a sniper on the grandstand roof, is how my imagination replays the incident. I was in open space without a single player around me, and suddenly I collapsed into a heap on the ground. Absolutely devastated. I knew that it was something wrong. After years of playing rugby, I knew that my ACL was in bad shape. That haunting popping sound happened in my knee, which many teammates had described before. As weird as it seems, at that moment my knee gave way I could imagine the anatomy of my knee and the rupturing of the ligamentous fibers. Our physiotherapist tried to reassure me, “It might not be that bad,” however, I knew it was. There was a lot of pain for about two minutes, calming into a dull ache and then strangely only limited swelling, which is uncommon for most people . Everyone experiences something different and sometimes you do not even know you have done it, thinking you can play on. However if you can play on (which I would strongly advise against), the knee is put under more pressure as there is instability and further damage can be done. The dreaded popping sound typically only means one thing. A tear or rupture. Will I ever play again? Is this how my career ends? I will never play for my province or national team. Wonder if I can actually walk? What if I can not walk again? Was that a forward pass back there? Did I just get knocked the f$%k out? At one point I thought I was just making it up because most of the pain dissipated quickly. In reality when things settle and more importantly your mind settles you can tackle the task ahead whatever the outcome. A lot of people have recovered from much worse injuries or accidents and shown a recovery that resembles that of Wolverine in X-Men. Professional Rugby Players who have successfully recovered from an ACL injury to play top-level rugby again include; Jonathan Davies, Rhys Webb, Jamie Roberts, Alex Dunbar, Quade Cooper, Aaron Cruden. You must have surgery – This is a myth proven by many athletes who never undergo the repair. For example, All Blacks Sevens player Sam Dickson didn’t and has since played in the Olympics. Surgery will work every time – The fact is there are always risks with surgery. Your new ligament may not work first time round. Every physiotherapist knows and cares about your treatment – A lot have very good information and tactics to help you but physios are not superheroes, and more advice is always better than less. Everything will be perfect after surgery – The truth is that it is a long recovery. You will have uncertainty yet it is not impossible to return to the same level of sport. You have bad knees and always will – This is a load of sh$*. It is a poor excuse not to do the work. Anyone can overcome knee problems with the correct strength and conditioning exercises. An ACL rupture is the end of your career – see players who have recovered above. You must take all your prescribed medication – Normally you will be prescribed something like, paracetamol 500gm, ibuprofen 400mg, and something a little stronger like dihydrocodeine 30gm. Taking the pills made we feel like s*$t and I felt down mentally, so I stopped taking them after two weeks. I am not a doctor so seek his or her advice with regards to medication. Personally, I’m not the nicest person to be around when on the medication. Science and Technology are improving every day. Research is being done on people who are hyper flexible and using different methods to repair the ACL. For example using other people’s tissue or animal tissue for better surgical results. Bridge Enhanced ACL repair. The new technique, bridge-enhanced (TM) ACL Repair (BEAR(TM)), uses stitches and a bridging scaffold (a sponge injected with the patient’s blood) to stimulate healing of the torn ACL providing a quicker recovery and fewer complications in later life. 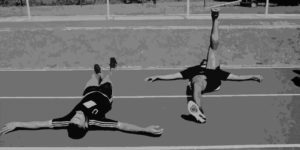 Incorrect training techniques and form has lead to an increase in lower leg injuries. In general, we live a more sedentary lifestyle which has an effect on health, mobility and athletic performance. It is important to understand the stats and how common ACL injuries are. Annually there are around 200,000 ACL injuries. Over half of these need reconstructive surgery. Approximately 50% of ACL injuries occur with injuries to other structures in the knee. This includes damage to the meniscus (50%), medial ligaments (30%), or articular cartilage (30%). Some complications can happen after surgery. These include infection, neurovascular injury, and thromboembolic disease is extremely rare (0.2-0.48%). Deep vein thrombosis is another low probability (.12%)3 complication. Graft misplacement complications. Basically, your surgery has been cocked up. Careful attention to detail during surgery must be observed to avoid these complications (2). Other complications include knee stiffness (5-25%) anterior knee pain (10-20%). Patellar tendonitis (20% in the 1st year, then rare afterward. Patella fracture (.35-1.8%). It is important to know when it comes to Rugby ONLY 45% return to competitive sport. 63% return to the previous level of sport and 80% return to some other form of sport. A recent study (3) published by Arthroscopy Association of North America found Rugby players were likely to return to play after ACL reconstruction with a hamstring autograft. However, there was a higher risk of graft failure in younger players than in older players. From this study, it was concluded that the hamstring autograft may not be an appropriate graft source to use in a younger active population, including younger rugby players. Firstly stay positive. There is no good drowning your sorrows and making decisions about the future of your rugby career until you have all the information. Many players have overcome the injury. If you are a professional player use all your resources, medical teams, and players associations to get the best results. If you are an amateur, I hope you are covered by ACC (if in New Zealand), or you have insurance. If you have none of the above here is some info for you. Managed swelling with ice, got a comprehensive diagnosis, MRI and consult with a specialist knee surgeon. Worked on movement and strength exercises as much as possible to help the knee before surgery. Tried to stay positive, as I thought I might never play Rugby again. Pitchside treatment is difficult to remember, to be honest, I was not actually listening to our physiotherapist. A typical test a physio might use to test your ACL is the Anterior Drawer Test. However, swelling can make the knee act like there is an end point in the ACL. (Endpoint meaning it is still attached and not completely snapped.) Managed any swelling with ice. I got a comprehensive diagnosis with an MRI and consulted with a surgeon. Worked on movement and strength exercises as much as possible to help maintain strength prior to surgery. I was scheduled for a surgery which would take a piece of my hamstring, and that would be used as the new ACL after the broken one was removed and cleaned up. This is called a Graft. There are three common types of graft harvest sites: Patellar tendon, hamstring tendon, quadriceps tendon (4). Further research into injury, planning and goal setting with physiotherapist and surgeon.I actually missed my pre-surgery appointment. This is good to go to so you can ask as many questions as possible and they check all your vitals. To get around this, they agreed to look at my blood pressure before the surgery. They would have canceled my surgeon if I was not in good health. Hamstring graft, left knee reconstruction. Note the amount of swelling around the knee and atrophy of the quadriceps only a few days after surgery. Isometric Quadriceps – Sitting with a straight leg and flat surface under the leg, active the quadriceps and focus on pushing the knee joint towards the floor. Hold for 5 seconds and relax. Repeat 3-5 times, 3-5 times in the day or whenever bored. Short arc Quadriceps activation – Sitting in the same position place a foam roller or a towel under your knee, so the leg is slightly bent. Activate your quadriceps and lift the foot off the ground. Hold for 5 to 10 seconds and lower with control. This exercise would make my leg almost tremble. But in performing it, we are learning to active the quad again to protect the knee. Straight leg raises – This was a little tricky at the beginning, so it is a progression from the short arc exercise early on. Sitting in the same position with a straight leg and quadriceps activated. Raise the foot off the ground keeping a straight leg. Leg Flexion – Lying on your back or sitting on a flat, smooth surface. Slide the heel of your foot (operated leg) towards your buttocks. For best results, you can use a sliding aid or wear a sock. Use your arms to help progress to full flexion of the knee. Progress further by laying on your back with your legs up a wall. Using gravity in this way can increase flexion in the knee. 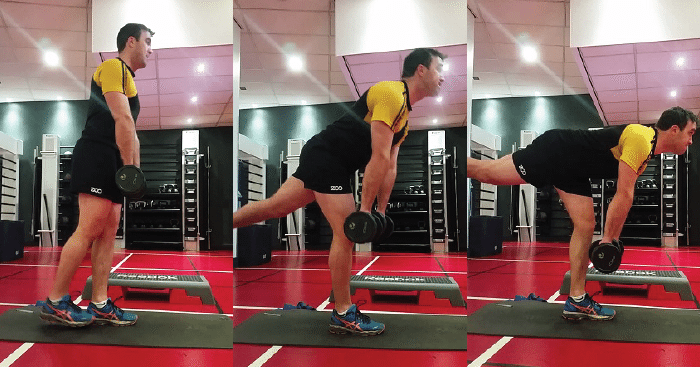 Single Leg Balance work – Throughout the day standing on one leg and doing a very small single leg squat (1/10th of a squat- just in the range to activate quad and complete without pain). Also balancing on one leg with the heel raised off the floor. To progress this exercises, try closing your eyes to make it harder. 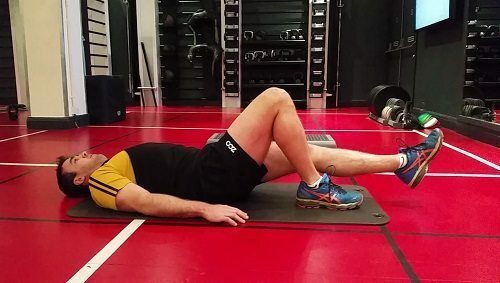 Foot Patter – Lying on your front with a slight gap between your knees. Lift the foot and heel towards your buttocks keeping your ankle flexed. Move the foot back down onto a pillow extending your foot. Similar to a kicking motion in the pool. I put a pillow under where my feet would finish and patter lightly on the pillow activating the hamstrings. 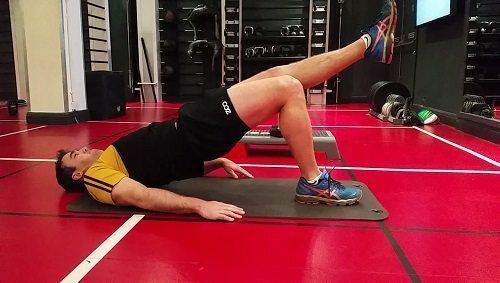 Peterson Step Up – Very simple exercise but one of the best when recovering from a knee injury. It can be completed at a low high depending on your pain level and progressed by using a higher step up a block, holding dumbbells or then adding a weighted barbell across your back. One foot is on the step or platform with the heel raised. The other foot is straight with toes and heel locked at forty-five degrees. See Video Here from Charles Poliquin to help with the correct form. Move your kneecap or ‘patella’ around when you have a straight leg. Massage around the muscle and wounds. Once the stitches are out I massaged the area and skin to help break up any scar tissue and help the skin move more freely. Using a Thera-band can help in initial recovery and providing tension if you are unable to lift weights. Lying on your front with your leg hanging off the bench or bed helping you get full extension. It is important to get full range of motion early. It might require some pain and some effort but will help with full mobility later in the recovery process. This is where I continued to work on the exercises above. I also added in some exercises designed to correct imbalances and to develop strength-endurance. I also added extra prehab – rehab exercises for the rest of my body to fix any other niggles. To correct imbalances I did more single leg work on my injured leg compared to good leg. Firstly I worked on range of movement and correcting any imbalances in the body. (notable differences in both legs and core strength). After correcting imbalances, I focused on muscular endurance. This phase was lighter weight or theraband and higher reps of 10-15, x 3 sets. Having a lighter weight allowed me to focus on movement and get the knee working longer. Once I had a sufficient amount of time 6-8 weeks of higher reps I cycled in a strength phase using a rep range of 2-3reps with heavier weights and longer rest 2 minutes -3 minutes between sets. After further gains, I followed up with a mass building block working to reps of 5+ or failing at the 5th rep. Using a heavy weight and a tempo of 5 seconds down, hold for 2 seconds, 5 seconds up. It took a long time after the operation to regain full strength, so I was still much weaker in the left leg. To help build the muscle up I did mostly single leg exercises to failure and to make the recovering leg work harder I used my other leg to help push more reps out with double leg exercises. For example the quad extension exercise machine. With a heavier weight, it was difficult to complete the full range, so I worked the muscle at different points in the range and held for a 5 second to 10 seconds. This was then repeated. Endurance, strength then Mass. Still doing a lot of cycling, swimming and running in the pool. There is no clear time frame, so it will be different for everyone, but this is where I was. A good tip is to measure your success and improvement by month. This helped me with my mindset and always showed an improvement even if each week it was hard to see. I was still doing a lot of the same exercises in stage two as stage three. The leg will regain enough mass and will have a noticeable improvement in strength giving you the confidence to increase your training. I was feeling strong enough to start jogging. Here is a program I did in the first few weeks of running. Return to running. You can be overwhelmed with everything that needs to be done however do not use this as an excuse to do nothing. Depending on your goals or your own personal weaknesses you must tailor your training regime to suit. I felt at one point my quadriceps were working well, but I needed to add in more hamstring work. The best exercise I can recommend to develop hamstring strength are the Nordic drops or swiss ball hamstring curls. Romanian deadlifts and single leg Romanian deadlifts. 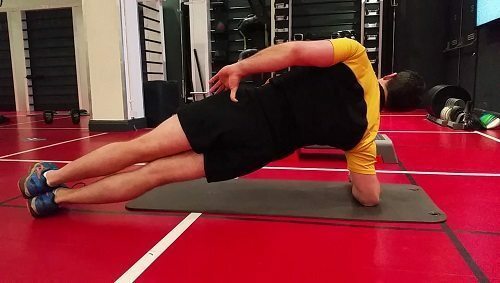 As you make the decision to return to rugby, it’s vital that you continue performing your strength exercises but working in more dynamic movements and on multi-directional planes. This is where the knee should be at 90-100%. 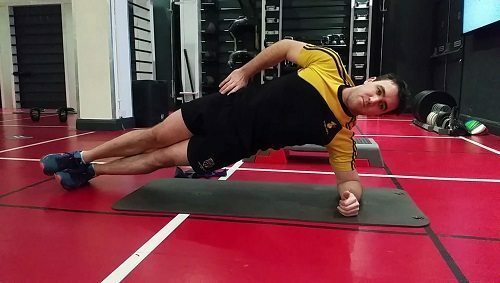 You can start to build in sport specific exercises and more power work. Continue balance and proprioception work – benchmark standing on one leg with eyes closed for over a minute. Start with multi-directional movements, bounding, hopping, skipping and further progression in running. 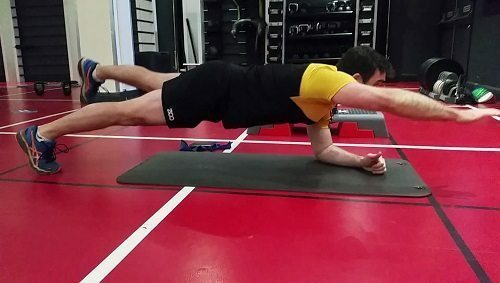 Continued strength exercises and the start of developing power exercises. Gradually build into Rugby training. Avoided contact early on and add some bits of contact in each week to build confidence. Complete at least two full weeks of training without contact and two full weeks of training with light contact. Game 1 – Started played 55 minutes – Struggled with match fitness and hamstring tightened up just after half time. Should have just played 40 minutes. Not resting when you should be resting – This can be difficult for some of us. Not working the knee early when you should be working the range. This is difficult as you want to protect yourself from pain. Not icing enough. I recommend getting an ice pack that can be strapped onto the knee and removed when needed. Also, a bag of ice in the freezer helps, so you do not have to keep filling up the ice trays. Working too hard and not giving the body enough time to recover. A common mistake when training to build muscle is to workout more. When building muscle mass, it is important to have enough rest to allow the body to grow. Not getting enough range of motion prior to surgery or running. Everyone should have their own specific injury prevention program. 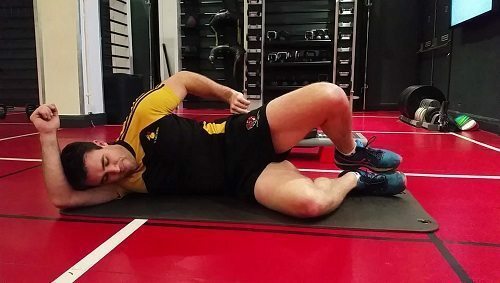 It should be position specific as many of the injuries we get as rugby players are position specific. For example, Props have a higher rate of spine and neck injuries and disc problems due to the forces in the scrum. As a fly-half your a more susceptible to hamstring injuries and groin injuries due to higher amounts of kicking and sprinting. Below is my small Pre-hab/Rehab program to add into your program to help avoid injury. Proper screening and testing should be done on your own body to have the best outcomes however here is a basic injury prevention program to add into your strength and conditioning. While lying on side with your spine in neutral, hips stacked on top of each other and a 45-degree angle at the hip joint kip leg straight up and lower slowly and controlled. This is progressed to holding the foot in the elevated position and moving the foot in small forwards circles ensuring the movement occurs at the hip. Several of these were covered in the recent article covering exercises to master breakdown poaching. The weighted crawl is a good one. Check that article and the video to get the low down. 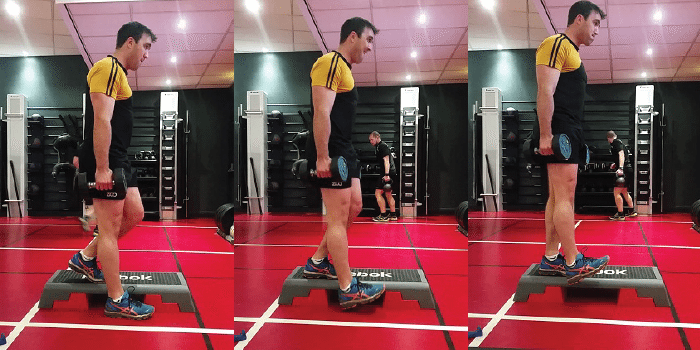 Standing on one leg – great for ankle and knee proprioception. This is easy to add into all areas of life when you are waiting. Swimming, walking and stretching in a cold pool Light 20-30 minute bike ride or stationary cycle in the gym Ice baths or intermittent hot and cold exposures finishing with cold. Good Nutrition – Foods to help fight inflammation for Rugby players are oily fish or fish oil tablets (make sure they are good quality), Blueberries, Beetroot, nuts, leafy greens, garlic, turmeric, ginger, and tomatoes. Have you experienced an ACL injury playing Rugby? What was the best exercise you did or have been doing to prevent knee injuries or other injuries? We welcome your questions comments and recommendations to help rugby players who have suffered an ACL injury to return to rugby.